mcwalter.org and mcwalter.net : The homepage of Finlay McWalter. 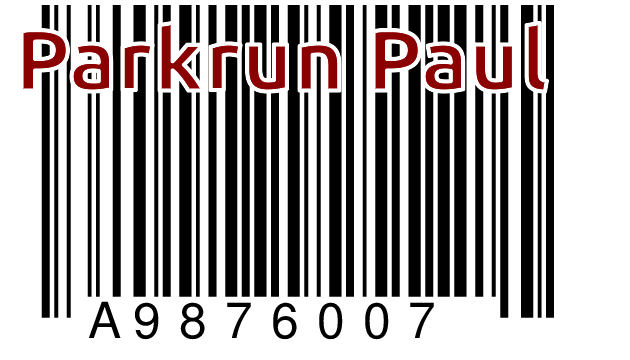 Parkrun, a popular running community, uses barcodes to identify runners. Runners can print their own code (many laminate it, so it survives the rigors of the race and the elements) or buy various tokens like keyfobs or wristbands or a running shirt with the barcode printed on it. One less thing to carry, but one more bill to pay. The documentation for PyCrypto's implementation of the PBKDF2 (Password-Based Key Derivation Function 2) scheme isn't super clear about how to use an alternate hash function for the pseudorandom function. Here's a little example I've cooked up. password = "A long!! pa66word with LOTs of _entropy_?" In George R. R. Martin's fantasy series A Song of Ice and Fire, the kings of the unfortunate land of Westros (not Nova Scotia) sit on a throne made from hundreds of swords, which is supposed to look like this. The swords are those of an ancient king's enemies, and the uncomfortable chair they comprise serves to remind the incumbent monarch of the precarious, painful nature of lordship. It's a neat analogy; but did Martin invent it, or was it (of all unlikely fantasy authors) Boris Yeltsin? In a speech on TV in 1993, three years before A Game of Thrones (the series' first book) was published, Yeltin said "You can build a throne with bayonets, but it's difficult to sit on it" (reference). The normally pretty thorough TV tropes doesn't have like it that predates either (trope: Throne made of X) - obviously both Yeltin's and Martin's thrones owe a lot to the Sword of Damocles. To Martin, of course, it's a fun fantasy in a magical land of boobies and dragons. To Yeltsin thrones were no abstract plaything - for him, as for Henry VI, uneasy lies the head that wears a crown. Perhaps uneasy sits the bum underneath it too. Driverless cars are coming, sometime and maybe. Some of us, at least some of the time, still enjoy driving. But even if you never let the car drive itself when you're in it, even if you always drive to pick people up and drop them off, there are plenty of reasons why you might let the car drive itself when you're not in it. The additional capabilities this gives the car may change the way we use cars at least as much as when we're in them. You drive to the city centre to go shopping. But you don't drive around looking for parking, you just drive to where you want to go, get out, and say "go find a parking space" and the car obeys. When you need it back, you can summon it with your phone. The car is due a service. You just go to work as usual, but when you get there you just get out at the office and send the car off to the dealer. Once it's done, the car comes back and parks in the office lot. Your daughter phones you from school. She's forgotten her sports clothes, which she needs for third period. You find her sports bag and put it in the trunk of the car. You send it off to her school. When it gets there it parks in the school lot and messages her; at the end of the next period she comes out and gets the bag from the car (which unlocks only for her). You paid for that car that's sitting idle in your garage right now. If you know you won't need it for the rest of the day, if it's self-driving you can rent it out via a car-share site for a few hours to someone else. It'll deliver itself to them when they've booked it, and when they're done it'll return and park back at your house. The car is electric, but your office (mall, cinema, apartment complex) doesn't have enough inductive chargers for every electric car. You turn over (limited) control to the building's valet-manager system, which shuffles all the cars around over their stay, making sure each gets enough charge to get the driver home. This last part is maybe the best part. Why does your office, or your apartment building, even have parking next to it? With self-driving cars, it doesn't need to - it can contract parking from some parking lot blocks, even miles away. And valet parking (which is what happens when all the cars in the lot are self-driving, and are controlled by the lot's valet manage system) can manage where every car is kept. With cars parked millimetres apart (no need to open the doors) bumper to bumper, it can manage double or triple the density of a normal lot. You tell it when when you'll need it, and the system can make sure the car is shuffled around when it's time. If you have a genuine emergency (which means you can't wait five minutes for an emergency shuffle to occur) the lot will send a taxi. With self-driving cars, particularly electric ones, the future may spell bad news for parking attendants, taxi drivers, and filling station cashiers. Adapted from my reddit post of yesterday. Neil Young (yes, him) is backing a Kickstarter for a new high-definition portable media player, Pono. It's daft. Pono promises high quality, high definition digital portable music. CD-DA isn't a perfect format, and munged through mp3 codecs it's a bit worse, with data compression, loudness, range compression, and simply there (usually) being only two channels. In an ideal listening environment, with decent speakers and a quiet room, this might possibly matter. But in a portable environment it just doesn't. The track record of better-than-CD-quality digital audio isn't a good one anyway. HDCD, SACD, and DVD-A never made much of a dent. In part people just don't care enough (perhaps they're ignorant of the wonders they're missing, perhaps not), and in part copyright holders are reluctant to put such a high-quality stream in their customers' hands (knowing how readily media DRM schemes have been cracked). Perhaps it's time for another crack at getting a high quality digital music standard off the ground. Perhaps iTunes and SoundCloud and Facebook have altered the music marketplace enough that there's room to market better product right to the consumer. A coalition of musicians, technologists, and business people maybe can establish a new format, one that can be adopted across a range of digital devices and can displace mp3 (which is, I'll happily admit, rather long in the tooth). But portable media is a dumb space in which to do it. And building your own media player is dumberer. People listen to portable players when they're in entirely sub-optimal listening environments. They're on the train, in the back of the car, they're in the gym or they're walking or their running down the road. There's traffic noise, wind and rain, other people's noises, and the hundred squeaks and groans of the city. And they're listening on earbuds or running headphones or flimsy Beats headphones. The human auditory system is great at picking out one sound source from the miasma, but it can only do so for comprehension not for quality too. High quality audio in all these enviroments is wasted - it's lost in the noise. When I started running, I had a hand-me-down Diamond Rio PMP300. It came with only 32MB of internal storage - that's barely enough for a single album encoded at a modest compression level. So I broke out Sound eXchange and reduced my music to the poorest quality I could manage, and eventually reduced it to mono too. With that done, I could get a half-dozen or so albums on the player, enough that I could get enough variety that each run didn't just follow the same soundtrack. With skinny running headphones, the wind and the rain, the traffic noise, and the sound of my own puffing and panting, it just didn't matter that the technical qualities of the sound were poor. And now, a decade later, when I have a decent phone that plays high quality mp3s, it doesn't really sound any different in practice. So even if people buy Ponos, even if media executives decide to sell them high-definition digitial audio, if they pay (again) for all the music, in the environments most people will be using their Pono, the difference will be, in practice, inaudible. The introductory zombie scene in the film World War Z, while set in Philadelphia, was filmed in central Glasgow, around the City Chambers and George Square. I know that part of Glasgow pretty well, but they really did an excellent job of making it look American and disguising its weegieness. I've pored over the entire scene, and here (mostly shot by shot) is a breakdown of where the shot was taken, with Google Maps links. 10:08 roadblock - On the bridge: woosh, we're on the bridge on the Camden NJ shore, looking west into the Philly. Full text of older blog entries and website news are stored on the blog index page. The photo archive contains a number of photos of landscapes, buildings, nature, and animals with silly expressions on their faces. There's also some high-resolution digital pictures of various natural and artificial textures, which may be of use for texture mapping applications. New: I've added some of my favourite closeup photographs, prepared in nice large sizes, to the new backgrounds section. The source for a tiny java web server (HTTPd), together with some commentary, is available under the GNU General Public Licence (GPL). With some help from various people I've gotten this down to just over 15 lines of (horribly unreadable) java code. Can you make it any smaller? Are you tired (or embarrassed) of that uncomfortable delay between launching a large java application and it actually appearing? Help overcome your feelings of inadequacy by wrapping your application in this handy java application splashscreen application, which can show a logo or other graphic while the main application loads. This page also contains a few weird tricks you can do in the java programming language (but shouldn't). A discussion of optimisation, in the context of a simple java text processing program is presented in the the java hexdump page. Surprisingly, this shows we can write text processing programs (which are generally IO bound) as fast as decent C language programs. Some advice for the novice website creator and designer. What do I think of the website of british furniture retailer Habitat? Not much. As almost any user of UNIX and its workalike environments knows, there's really no point in writing your own utilities - as soon as you're finished you'll find someone already wrote a better, simpler, faster solution to the same problem, probably in about 1970. Here are some UNIX shell programming gems that I discovered, shortly after writing my own versions. Like its ID Software predecessors, Activision's game Return to Castle Wolfenstein contains a number of secret areas, cunningly positioned throughout the game to divert the player's attention from how interminably dull and criminally derivative this rather average game is. Tim Schaefer's Day of the Tentacle is one of the best computer games of the lost "second age". It worked (with an unpleasant amount of that nasty config.sys wrangling) under DOS and older versions of Windows but it really doesn't work properly under Windows XP. One might think Lucasarts might have released a DirectX version for windows, but perhaps moths have eaten the tape their only copy of the sourcecode is on (or something like that). This site contains some mystical instructions for playing DoTT on Windows XP and (I think) on Windows 2000. Kindly multi-lingual readers have produced translations of this page into norsk, and nederlands. If you'd like to contribute a translation, even into something mad like Klingon, then I'd be happy to host it. Although it's not very hard, and it's impossible to get it "wrong", some folks have asked me for a walkthrough of DoTT. As it rather spoils the game, I'd strongly recommend you read it only if you're really really stuck. For your convenience, there are also the answers to some DoTT frequently asked questions. Copyright © 2001-2015 W.Finlay McWalter. ALL RIGHTS RESERVED. No part of this website may be redistributed in any form without the express written consent of the copyright owner. NO WARRANTY of any type is given for this website, or for the information or software programs presented herein. Users proceed entirely at their own risk. Continued viewing of this website consistitutes acceptance of these terms. Trademarks of other entities are the properties of their respective owners, and do not imply their sponsorship or endorsement of this website or its content.